From 1910 to 1940, the Angel Island immigration station in San Francisco served as the processing and detention center for over one million people from around the world. The majority of newcomers came from China and Japan, but there were also immigrants from India, the Philippines, Korea, Russia, Mexico, and over seventy other countries. The full history of these immigrants and their experiences on Angel Island is told for the first time in this landmark book, published to commemorate the immigration station's 100th anniversary. Based on extensive new research and oral histories, Angel Island: Immigrant Gateway to America examines the great diversity of immigration through Angel Island: Chinese "paper sons," Japanese picture brides, Korean refugee students, South Asian political activists, Russian and Jewish refugees, Mexican families, Filipino workers, and many others. Together, their stories offer a more complete and complicated history of immigration to America than we have ever known. Like its counterpart on Ellis Island, the immigration station on Angel Island was one of the country's main ports of entry for immigrants in the early twentieth century. But while Ellis Island was mainly a processing center for European immigrants, Angel Island was designed to detain and exclude immigrants from Asia. The immigrant experience on Angel Island, more than any other site, reveals how U.S. immigration policies and their hierarchical treatment of immigrants according to race, ethnicity, class, nationality, and gender played out in daily practices and decisions at the nation's borders with real consequences on immigrant lives and on the country itself. Lee and Yung offer a kaleidoscope of immigrant portraits that bring history alive, and, in the process, demolish many myths and stereotypes about Angel Island and American immigration in general. "Angel Island" is a fitting offering on the station's 100th birthday." 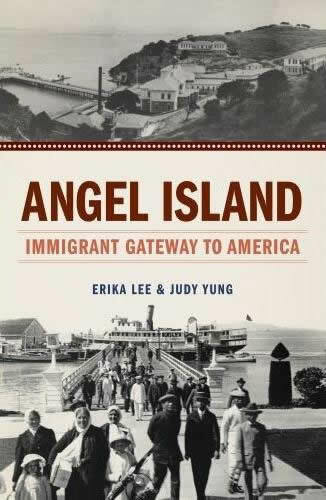 "Erika Lee and Judy Yung have written the definitive book on Angel Island. The book is meticulously researched and covers not just the Chinese experience but the experiences of all the people who passed through the immigration station. Lee and Yung have used the personal stories of immigrants to make time and place come alive, reminding us that history is something that happens to real people and their families."